At Lowe’s we take pride in what we do. 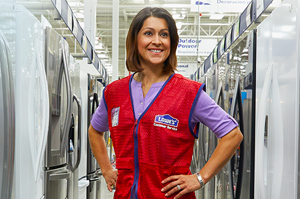 Our employees are committed to providing customers with a positive experience every time they do business with us. Technology is beginning to shift the way the retail industry operates, and our IT department has gone above and beyond to adapt. 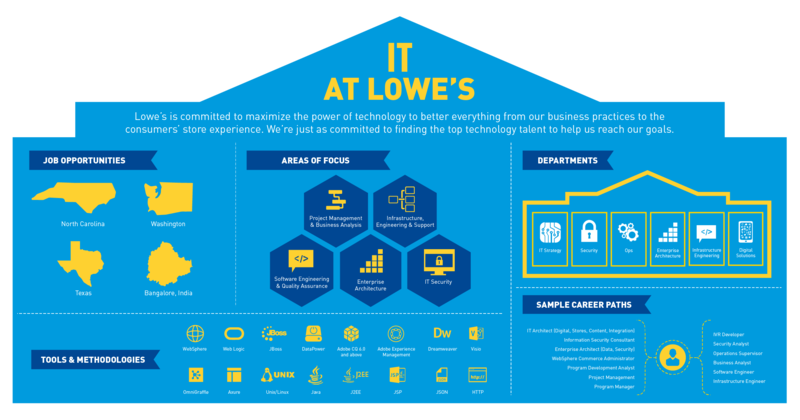 What sets Lowe’s IT department apart from others in the industry? 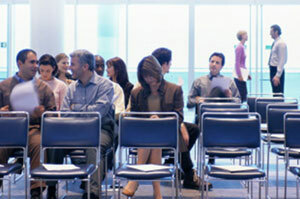 Our dedicated IT team works together in a fast-paced environment to exceed our customers’ expectations. We foster creativity and encourage our employees to share their own ideas on how we can improve and differentiate our customer experience from other brands. What can you expect while working at Lowe’s? As an IT employee with Lowe’s, you can expect to learn from those around you while challenging yourself to think outside the box. Whether you’re an IT engineer side, you will feel a sense of empowerment when you are given the opportunity to make a difference. In IT at Lowe’s, you will have numerous possibilities for growth and development — just a take a look below! If you’re passionate about technology and want the chance to do more, join our team today!